Review by blob on 12/14/2015. Not bad, but if you start with the center territory in the initial distribution you have a huge advantage. Probably too much of an advantage. Review by Aura Guardian on 12/14/2015. 1. There is a missing connection between The Sea Side Public House and The Lonely Mountain (either that or the line is ambiguous and should be fixed to remove the ambiguity. 2. The "treasure" bonus is far too large to make game play balanced. 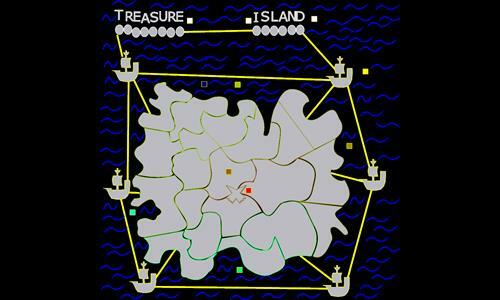 I know that you are trying to imitate the "Treasure", as in "who gets the treasure wins" but, this makes it strategically imbalanced unless you add in a custom scenario where everyone starts out at the ships. At most this bonus (Albeit still very imbalanced if put to this value) Should be 5, and preferably 1 or 2. 3. I have never understood the purpose of mega bonuses that take over half the map to complete. If someone controls over half the map as it is, they should probably win anyway. I would recommend splitting The Island Mega bonus in half, possibly excluding "central island" and "treasure" from both, or getting rid of the megabonuses (including the "words" megabonus) Altogether.